Light: Investing time in learning or teaching a difficult task. Restraining yourself from physical or financial extremes. Making sacrifices as a way of achieving larger goals. Breaking a complex task down into simple steps. Wanting what you have. Knowing the difference between needs and wants. Shadow: Being assigned to a task without being trained to perform it. Pursuing a position for which you are not qualified. Disregarding requirements. Refusing to dedicate adequate time or attention when learning about something or someone new. Always craving more. Story: The Main Character outlines a detailed action plan, step-by-step. Alternatively, the Main Character is placed in a position for which he or she is completely unqualified. Relationships. We learn about love from our parents, but their examples may or may not be suitable for relationships we forge for ourselves. Everyone has something to learn about love. Model the level of love and patience you want your partner to provide. Work. Many problems arise when people are assigned to tasks to which they are not suited by training or nature. Where’s the disconnect? Identify what you don’t know, and ask for appropriate training. When using unskilled workers to do an elaborate task, scale expectations accordingly. Spirituality. Wanting what you have can transform your world. All too often, we get caught up in the ruthless cycle of pursuing “bigger and better,” when, in fact, we could very easily make do. Today, consider how you can delight in what you’ve already been given. Personal Growth. Be patient with yourself. Seek advice from those who easily do what you must strive to do. Give yourself time to learn a new process. If you’re hoping to engineer a change in your own behavior, recognize the value of little steps toward your goal. Fortune Telling. Until you appreciate what you have, you won’t have any luck getting more. When? Between September 2nd and 11th. The Hooded Falcon. Decks in the RWS family often illustrate this card with an image of a fine lady training a falcon. Training an animal requires patience and empathy. How might these qualities play a role in your situation today? The Bumper Crop. 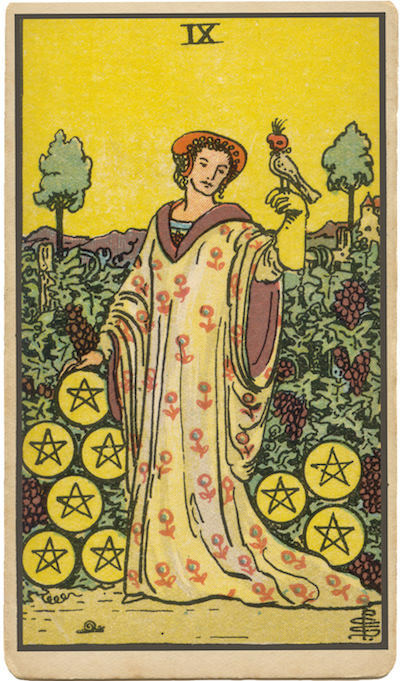 While the lady of the manor focuses on the task at hand, a rich harvest of pentacles grows. Her bounty looks effortless, but a crop this rich doesn’t happen by accident. How have past efforts (or a lack of effort) shaped the situation you find yourself in now? To what extent is someone reaping what he or she has sown? The Marseilles Image. The ninth Coin squeezes into position, disrupting the careful balance of the Eight. It bulges outward, forcing all other coins to the extreme ends of the card. In what way might your “desire of the moment” caught similar crowding in your own life? If you could not have what you want, how would you make do? Could you make a complex task easier by breaking it down into smaller steps? How patient are you during the learning process? With yourself? With others?